I originally trained as an illustrator, but did not pursue this professionally. Apart from drawing and painting, I have experimented with a variety of crafts, including: macramé, needlepoint, clay, plaster of Paris, papier mâché, hand-made books, a little embroidery and appliqué, and most recently rag rugs. Wanting to learn more about textile arts, I completed the Open College of the Arts Textile 1 course, which was challenging but very enjoyable. 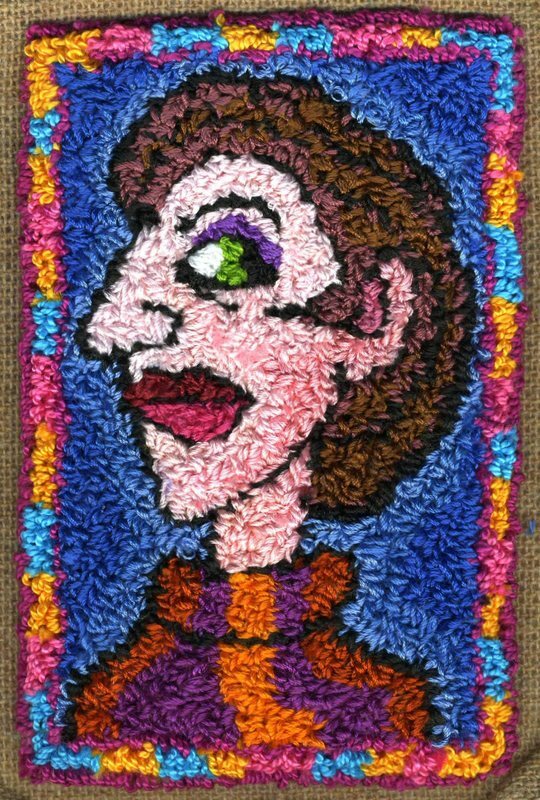 I discovered rag rug making several years ago. The simplicity of the technique particularly appealed (I have an aversion to using machinery and avoid it if I can!) as well as its versatility and the traditional use of recycled materials - a great excuse to go to jumble sales! My style is graphic, slightly quirky and mostly features people and animals, both real and imaginary. I work on small scale rag rug wall-hangings in a variety of recycled fabrics, supplemented occasionally by tapestry wools for fine details and metallic threads and other materials for special effects. More recent work is on an even smaller scale, using a punchneedle with embroidery threads and tapestry wool. Over the last couple of years I've discovered stone-carving, mainly in alabaster, which I'm really enjoying, so textile work has taken a back seat for now. I do have on-going punchneedle and rag rugging projects underway, though have to admit they're progressing rather slowly but will get finished eventually! I’d been rag rug hooking for some time, but living in London (bit of a rag rug wasteland!) I wasn’t meeting other rag ruggers and was feeling rather isolated. So in desperation I decided to have a go at starting a London group.